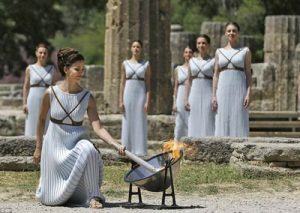 The 2016 Summer Olympic games won't begin until on August 5th of this year but already the Olympic Torch has been lit and is traveling to the game's site, Brazil, by 12,000 relay participants. Watch the lighting video and wonder how it was done ... where is the match? Our animation is simpler than trying to demonstrate the reflections of a parabolic mirror. Let your students study the sunlight reflections and hypothesize why the focus of the mirror gets so very hot. This activity might be used for students who are not yet ready for the study of parabolas. Or extend this lesson and model to the study of parabolas and the parabola's focus.